If you are confronted with a situation where you need to speak your mind about a possible patient safety situation, will you be able to do it effectively? This question was posed to the audience by Dr. Jeffrey Cooper, the organizer of this year’s annual APSF Board of Directors workshop. Although there are not empirical data to confirm how often such situations occur, Dr. Cooper reminded the audience about 2 tragic accidents in which a failure to speak up at all or to speak up effectively clearly contributed to these events. He and the 2 other workshop faculty, Drs. David Gaba and Robert Caplan, went on to lead a highly interactive workshop, unusual in the way this important patient safety topic was presented. The audience was introduced to an example of a challenging situation. A surgeon and an anesthesiologist, played by Drs. Robert Morell and Casey Blitt, respectively, appeared on the stage and enacted a scripted “mini-play” that illustrated an event that is similar to what most anesthesia professionals encounter periodically in the course of caring for their patients. The case involved an otherwise healthy 62-year-old, hypertensive male scheduled for 4 level spinal fusion in the prone position with an estimated OR time of 8 hours. The scenario began with the anesthesiologist placing a telephone call to the surgeon on the Friday preceding the case scheduled for Monday. During their first conversation, the anesthesiologist tried to raise his concerns about the surgeon’s request for deliberate hypotension. The anesthesiologist wanted to advise the patient of the risk of postoperative vision loss. The surgeon pushed back, without clearly explaining why. The anesthesiologist gave in, dropping further discussion of the perceived need for deliberate hypotension or the rationale for discussing the risks and benefits of deliberate hypotension with the patient. After this first play, audience members had a chance to share their own experiences with these kinds of situations and how they deal with them. Next, the scenario was repeated, but this time the spoken conversation was supplemented with “asides” to the audience. These “asides” were the private thoughts of the surgeon and anesthesiologist in this simulated drama. For example, the anesthesiologist, who hadn’t worked with this surgeon before, had heard from others that he was not one to accept disagreement. The anesthesiologist was concerned about avoiding conflict. The surgeon, in his private thoughts, felt that the anesthesiologist was being overly cautious and might unintentionally scare the patient from having the surgery, which he felt was strongly indicated. Dr. Caplan next presented to the audience 3 brief stories that illustrated the speaking-up paradigm. The first involved what became a much-publicized case in which a patient died after injection of chlorhexidine in place of contrast media. Retrospectively, all members of the care team learned that they had opportunities to break the chain of error and prevent the mistaken injection, just by speaking up. In another story, an anesthesiologist used effective advocacy to convince the surgeon to change his practice of shaving the surgical site and use the new protocol, which is known to have a lower infection rate. In the third example, a nurse spoke up and voiced her concern about an inappropriate order for chemotherapy from an oncologist. When he rebuffed the nurse’s concern, she asked for advice from the department chair, who instructed the oncologist to use the correct protocol. The oncologist then berated the nurse for her intervention. The nurse was backed up by the Department Chair, and the oncologist was reprimanded, placed in a performance improvement program, and later gave an apology to the nurse. These stories set the stage for learning how to effectively speak up in the kinds of situations that might arise in the life of an anesthesia professional. Dr. Gaba spoke about why it’s so hard to speak up and how to overcome the inertia. Some examples of the reasons for not speaking up are listed in the box. One additional influence is the phenomena of “social shirking” or the “bystander effect”—the expectation that someone else will take action so that yours isn’t needed. Dr. Gaba also discussed production pressure, the pressure to cut corners in order to maintain throughput, and how this can be a barrier to speaking up. There are different types of approaches to using effective speech to help overcome these barriers and to get others to share your concern without becoming defensive. One such approach that was suggested is using “advocacy/inquiry.” This involves maintaining curiosity and trying to learn the other person’s “frame” or point of view. This takes a lot of practice, but it can be very useful in many life situations once it’s mastered. The two-challenge rule was developed in aviation in response to accidents in which co-pilots did not successfully challenge a pilot’s errors or misjudgments. It involves raising a concern twice, more forcefully each time; and, if the concern isn’t recognized, either taking control or calling in a higher authority in the chain of command. There’s a chance they are right! Raise the concern in a non-confrontational tone. If the concern is not acknowledged, repeat with more emphasis. If the second challenge is not acknowledged, refer the issue to another person, e.g., supervisor with authority to intervene, trusted colleague. The common objective of these techniques is to get the team to focus on what’s right for the patient, not who is right (a slogan learned from an American Airlines’ Crew Resource Management course). The surgeon and anesthesiologist actors returned to the stage and repeated their conversation, this time using forms of advocacy/inquiry. When that wasn’t entirely effective they invoked an aspect of the two-challenge rule and agreed to get another opinion from a mutually trusted colleague, which likely led to a satisfactory outcome. Then it was the audience’s turn to try out the techniques. Everyone had been given 1 of 2 different envelopes. Each paired up with a partner with the opposite color dot on the envelope. One became the surgeon and the other the anesthesiologist in a new case that created some conflict. This case involved the choice of antibiotic. The surgeon had ordered cefazolin, but the anesthesiologist had learned that the patient had a prior allergic reaction to penicillin. The patient already had received 2 doses of cefazolin during this hospital admission and with no untoward effect. The anesthesiologist was still concerned and wished to avoid the potential for problems. The surgeon had his own reasons for wanting to stick with his original order. Each role player privately received more information in their written instructions about their perceptions of the issues and about the other person (each had some commentary the other did not have). The role-playing ensued with much vigor. The room noise level increased. After about 5 minutes, Dr. Cooper, with some difficulty, managed to get the energized players to stop to discuss the techniques they had used to get the agreement they needed. Because speaking up can be difficult for all the reasons articulated in this Workshop, no one exercise will succeed in “fixing” this serious problem. The Workshop was quite successful in articulating the problem more fully, and in exploring practical ways to mitigate it. 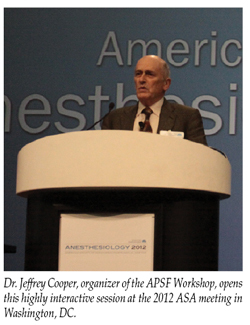 The APSF hopes to continue to search for ways to help anesthesia professionals to protect their patients from harm by becoming better able to prudently challenge others when necessary, regardless of the many factors that inhibit action. Dr. Caplan is Staff Anesthesiologist at Virginia Mason Medical Center, and Clinical Professor of Anesthesiology, University of Washington, Seattle, WA. Dr. Gaba is Associate Dean for Immersive & Simulation-based Learning, Professor of Anesthesia at Stanford University, and Staff Anesthesiologist and Co-Director at the Patient Simulation Center of Innovation, VA Palo Alto Health Care System, Palo Alto, CA. Pian-Smith MC, Simon R, Minehart RD, et al. Teaching residents the two-challenge rule: A simulation-based approach to improve education and patient safety. Simul Healthc 2009;4(2):84-91.